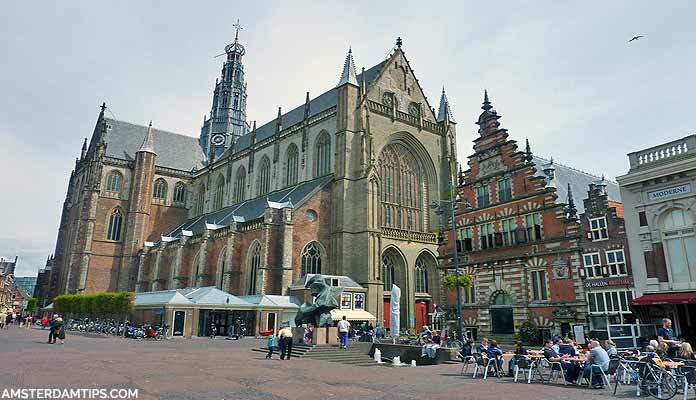 Haarlem is a small, historic city about 20km west of Amsterdam and can be easily reached by train. It has a picturesque centre with good shopping and is also home to a number of renowned museums including the Frans Hals collection. Arriving by train, the art nouveau-styled Haarlem railway station is around 600m north of the centre. A 10 minute walk down either Jansweg or Kruisweg will bring you to the Grote Markt, the heart of the town. The imposing gothic Grote Kerk (Sint Bavokerk, open 1000-1700 Mon-Sat, also 1200-1700 Sun in July & August) dominates the square. Entry costs €2.50, children 12-16 €1.25. The church houses one of the largest Müller pipe organs in the world, said to have been played by both Handel and a 10 year old Mozart. Monthly organ concerts are held at on a Saturday between mid-May and mid-October. A further 10 minute walk south from here is Haarlem’s foremost attraction – the Frans Hals Museum at Groot Heiligland 62. It houses a fine collection of paintings by 17th century Haarlem portrait artist Frans Hals (c1580-1666) as well as many other Golden Age artists. The building is a hofje – an old almshouse with an inner courtyard. Frans Hals museum also has a modern art exhibition space – De Hallen – housed in the old Verweijhal en Vleeshal (meat hall) next to the Grote Kerk at Grote Markt 16. Admission costs €15, free for children 0-18, Iamsterdam City card and Museumkaart holders. Special exhibitions can attract a supplement. Open 1100-1700 Tue-Sat, 1200-1700 Sun. The museum has a small café for drinks and snacks. Nearby is the Historisch Museum Haarlem (Groot Heiligland 47) with a collection of historical city paintings and artefacts. Admission €7 for adults, free for children 0-18 and Museumkaart holders. Open 1100-1700 Tue-Sat, 1200-1700 Sun-Mon. On the western side of Grote Markt is the Stadhuis (City Hall) – outside of which you will find a market on Saturdays and Mondays. Just east of the Grote Markt is the Teylers Museum (an art, natural history ans science museum at Spaarne 16) in a large riverside merchant house. It is the oldest museum in the country, originally opened in 1784. It contains a varied collection of art and scientific items from the 18th and 19th century. Check out the striking neo-classical Oval Room. Entry is €13.50 for adults, €2 for children 6-17, free entry to children 0-5, Iamsterdam City card and Museumkaart holders. Open 1000-1700 Tue-Fri, 1100-1700 Sat-Sun, closed Mondays. From the other side of the Spaarne river, one can take a boat cruise around Haarlem and beyond. Tickets are €13.50 and the trip takes about 75 minutes. There are a number of decent lunch places on the main shopping drag Grote Houtstraat. Hartig en Zoet (Grote Houtstraat 170) serves sandwiches, cakes or high tea using their own baked organic breads. Hofje zonder Zorgen (Grote Houtstraat 142a) has a similar menu with some organic products. The nearby Garrone (Grote Houtstraat 179) is the city’s best ice cream parlour offering authentic Italian gelato. Aangenaam (Kleine Houtstraat 105) is an organic eetcafé that is also open for dinner. For a classy Indian meal try Jai Bharat (Gedempte Oude Gracht 21-23); or top quality French restaurant Truffels (Lange Veerstraat 4). Another decent (and cheap) eat can be had at Bagels & Beans chain café (Gierstraat 49). Note, an organic farmer’s market is held at Botermarkt on Fridays. Patronaat (Zijlsingel 2) is the city’s main music venue with regular gigs. The Patronaat café is open late Thursday to Saturday. There is a VVV tourist information at Stadhuis (City Hall) at Grote Markt 2. 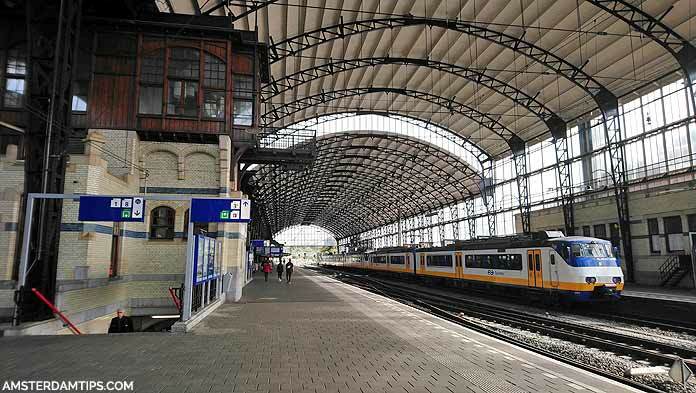 The regular NS train service from Amsterdam Central (usually platforms 1 or 2) to Haarlem takes just over 15 mins. The trains are either Intercity services (direction Den Haag Centraal or Vlissingen) or Sprinters (direction Hoorn or Zandvoort-aan-Zee). A day return costs €9.00 or €14.86 in 1st class (2019 prices). There is a €1 surcharge for disposable tickets.